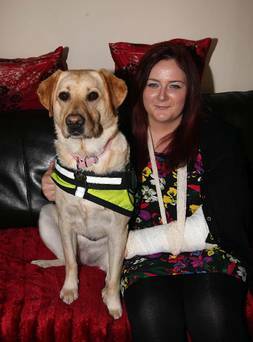 When a young Bangor woman, who suffers from epilepsy, noticed that her two-year-old labrador dog appeared to be able to predict a seizure in advance, she contacted one of Northern Ireland’s top dog trainers for help. Shannon Locke (21) was diagnosed with severe epilepsy after suffering a massive attack when she was 17. When her condition was at its worst, she was having up to 20 seizures a day, forcing Shannon to drop out of college and become housebound. A massive seizure meant Shannon ended up in intensive care needing brain surgery and on a ventilator. “I just put everything into perspective. I had all these dreams for myself, but my life had just been put on hold,” she says. Shannon had to go to live with her mum at this point as she couldn’t live independently, but even the simplest of tasks became hazardous: “When I was walking up the street, I would be looking out for sharp objects in case I had an attack and fell. When I take an attack, I just drop wherever I am and it was frightening. After a few months, Shannon moved out to live with her boyfriend, who worked away a lot. That’s when she decided to get a dog for company. “I’ve always had dogs, but they were usually Jack Russell terriers.” This time, though, she chose a cute labrador pup she called Poppy. The young dog soon settled into life with Shannon, but after a few weeks, the animal’s behaviour began to change – but only before her owner had a seizure. “Poppy began to act strangely, but it only happened before I had an attack. At first, she would sit and stare at me, then sometimes she would pant and pace around. I didn’t make a connection straight away, and took her to the vet as I thought there was something wrong with her. Poppy’s pattern of behaviour would manifest itself this way, but always before Shannon took a seizure, so she decided to seek out expert advice after doing some research on the subject. “I contacted Neil Powell, who is a leading dog trainer here. I had heard about his work training dogs for very specialised rescue and recovery work, both here in mountain rescue and abroad at natural disasters such as earthquakes. Because he knows about animal behaviour, he was able to tell me what the next stop was for myself and Poppy.” Neil has since trained Poppy to alert Shannon by pawing her leg before a seizure strikes, and the young woman’s life has changed beyond all recognition. Now, the Bangor woman’s condition has been stabilised with the right medication, and with Poppy a constant companion, she is feeling confident and is optimistic about her future. “I don’t feel worried when I’m out anymore, not now that I have Poppy. Shannon’s decision to choose man’s best friend to keep her company could prove crucial to providing pioneering research which could reap benefits for epilepsy sufferers worldwide. “I hope I can achieve something that will help other people. That is why I contacted Neil because of his expertise,” she says. Canine expert Neil needs more volunteers for the academic study, and his research could provide data to construct an electronic early warning device for epileptics. Shannon is proud to be part of this vital research and has urged anyone who can participate to get in touch. The young Bangor woman believes the combination of the top dog trainer’s expertise and her practical experience with Poppy could make life-changing improvements to many people’s experiences of managing their epilepsy. One of Northern Ireland’s leading trainers of search and rescue dogs has appealed for local volunteers to take part in a ground-breaking study which could transform the lives of epilepsy sufferers. Neil Powell, from Newcastle, has spent 30 years training dogs for emergency rescue and recovery work on mountains, collapsed buildings and even underwater. He is also part of the UK’s Fire and Rescue Service team which can be called upon to attend disasters anywhere in the world. Now the retired teacher is using his dog training expertise to conduct a pioneering study being carried out by Queen’s University, Belfast, which will examine whether dogs can warn epilepsy sufferers about a seizure before it strikes. Neil was approached by academics at the university to lead the six-year study and the research will be the first of its kind in the world to seek out evidence that some dogs can predict an epileptic attack in their owners. The former science teacher has worked with dogs all his life and was recently invited by the National Search and Rescue Dog Association of the UK and Ireland to write the assessment standards for handlers of drowned victim search dogs. His expertise covers preparing dogs to detect everything from explosives to people trapped under buildings, and he has attended earthquake disaster zones in Turkey, Algeria and Kashmir. “I was approached by Professor Peter Hepper and Dr Debbie Wells from Queen’s University who asked me to get involved in a research project which looks at why some dogs can predict an epileptic seizure,” says Neil. Around this time he was contacted by Bangor woman Shannon Locke (21) whose labrador dog, Poppy, had exhibited this behaviour – and her pet’s unusual ability has had a life-changing impact. “Shannon’s epilepsy meant she had to drop out of college and rarely ventured out in public for fear of having a seizure. She had been housebound for a year. Now though the early alert from Poppy means she can ensure she is in a safe place when an attack is imminent. Shannon, who had found out about Neil’s work with dogs, contacted him to tell him about Poppy. Now Neil needs up to 20 participants to take part in the scientific study. “I would like to hear from anyone in Northern Ireland who suffers from epilepsy and has a dog. I shouldn’t take up too much of their time,” he says. Shannon told Neil how Poppy would seek her out, then sit and stare at her and this would always precede a seizure. Neil then taught the two-year-old labrador to paw at his owner’s leg in a bid to alert her to an attack. Neil’s research so far indicates that some dogs, regardless of breed, gender or age can pick up on certain health issues from their owners, including high and low blood sugar in diabetics. “Typical behaviour from dogs appearing to warn their owners of an attack includes pawing at them, staring, pacing or hiding behind furniture,” he says. Neil says the study is the first of its kind in the world which will involve actually observing the behaviour in dogs to make it scientifically viable. A 2005 research project in Canada did look at this issue, but based its findings on a questionnaire. The new study would involve active participants whose reactions would be quantified.